1. The pit’s footprint is larger than that of AT&T Stadium. A private contractor hired by the Company of Trinity Forest Golfers started digging the monster in 2014. How much will we sacrifice to build the new Byron Nelson golf course? Decades ago, as modern Dallas grew out of the prairie, sucking up millions of yards of concrete for roads and buildings, the sand and gravel for that mix came out of huge pits dug in sediment-rich land near the Trinity River. Years passed, and those pits were filled with the city’s waste: old tires and rotten mattresses and dirty diapers. Dig a hole, put trash in it, cover the trash with dirt. Then eventually hire Ben Crenshaw to turn the whole thing into a golf course on which AT&T can stage the Byron Nelson tournament. That’s the rough timeline that led in late October to the formal unveiling of the Trinity Forest Golf Club, a privately run course on land owned by, and leased from, the city of Dallas. But where to get all that dirt for the sculpting of greens and fairways atop a trash heap? 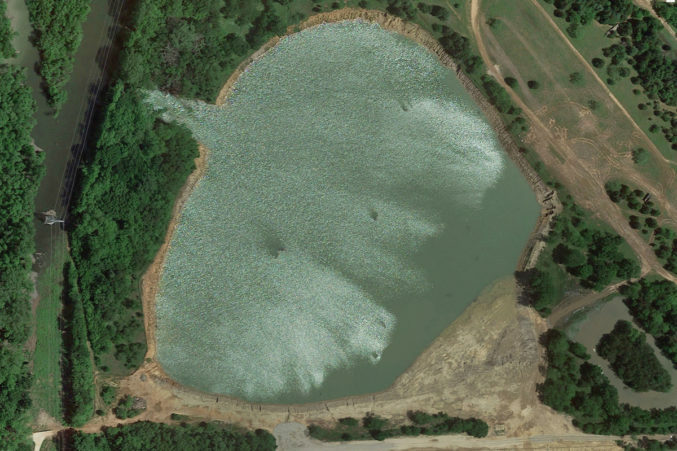 the water table and therefore might have compromised nearby Big Spring, one of the last remaining artesian springs in North Texas. 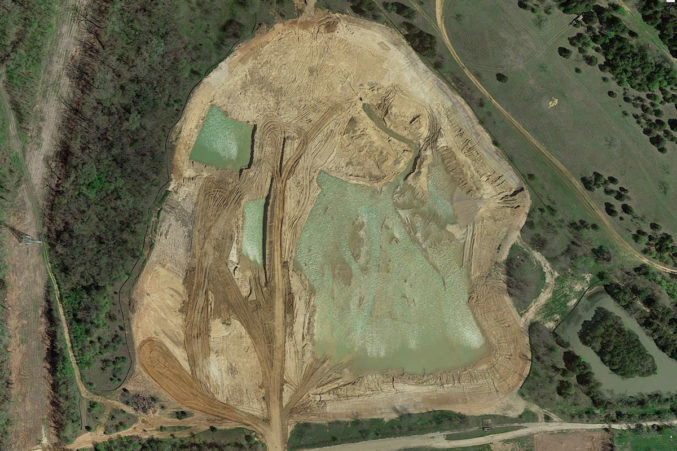 That brings us to what is formally known as construction site #3829-4, a “borrow pit” in the Trinity Forest used to mine dirt for the course. Its footprint is roughly 855,000 square feet, making it substantially larger than that of Jerry Jones’ AT&T Stadium. Its depth is a mystery because it has now become a potentially hazardous lake. Hundreds of mesquite, pecan, oak, and bois d’arc trees were felled to dig this pit. The city’s own regular inspections of the site (records of which were obtained only after a struggle over an open-records request) show that it has not been in compliance with state environmental regulations since January. In late October, in response to questions from D Magazine, the Environmental Protection Agency said it was “looking into the issue.” A week later, the Texas Commission on Environmental Quality assigned an investigator to the pit. 3. By April 2016, the pit had filled and breached a wall (10 o’clock position), pouring possibly contaminated water into the Trinity floodplain, a serious issue for the EPA and the TCEQ.